Governor Winfield announced in PaxOku today he will appoint Gareth as Mayor of PaxOku on Monday, June 25, 2007 at 8 PM ET in PaxOku, Tokuno at the PaxOku Mayor's Office and Inn (95-5N, 65-27W, PaxOku, Homare-jima, Tokuno, Chesapeake). Mayor Tatania Karthina resigned from her position as the Mayor of PaxOku in order to spend time looking for her brother Caius. She has served as PaxOku's mayor (and viceroy) since October 11, 2006. We wish her dragonspeed in her endeavors and will welcome her back to the Realm in several months. Deputy Mayor Gareth has been nominated to become the next Mayor of PaxOku. However, Governor Winfield will not appoint Gareth to the position until the "evil" Gareth persona within the Realm is brought to justice in Guardians Gate and that Gareth's power and influence is diminished over the mayor-candidate Gareth. Governor Winfield is the acting Mayor of PaxOku until a new mayor is appointed. Governor Winfield recently announced the PaxLair Statehood will hold a weekly PaxLair meeting in PaxOku on Tuesday, June 19, 2007 that may hold special interest for many people. Mayor Tatania Karthina of PaxOku will be resigning her position and Deputy Mayor Gareth of PaxOku will be appointed as the new mayor. However, rumors exist that the Governor has some undisclosed concern about Gareth involving another Gareth, an evil Gareth, within the Realm. Other announcements affecting the Statehood are also expected at the meeting, but are still in coordination with various officials before public release. In another bold move by Mayor Ga'kuct through his policy of PaxLair City reconstruction, orcs built an Orcish Shaman Hut where the Library of Courage once stood behind the outdoor arena. Ga'kuct said he won the building from the elves in a gambling game of cards. According to Ga'kuct, elves attempted to cheat at the card game with their elven sight. Ga'kuct said he then distracted the elves and also cheated. Upon his victory, Ga'kuct immediately threw the elves into the street and threatened to call the orcish guard if they did not leave the area quickly. Elves built the Library of Courage about a year ago and displayed books about PaxLair, particularly on Felucca. It is not known what happened to the books from the Library of Courage. They are either in secret elven storage or the orcs burned the books. This same location was used in early PaxLair days as the PaxLair Saloon and was "blessed" by the gods for the community. In later years, the blessings were removed at the request of the proprietor so a multi-story saloon could be created. In time, elves moved into the city and established the Library of Courage. Hail, I am Merik of the Oku News Network. This is your PaxOku War news story update. This afternoon the SHOT guild invaded the island of Homare-Jima. With Gareth not having a military to command quickly packed his personal items in the Emperors mansion and fled before the SHOT guild arrived. The challenge was made and the SHOT guild took over as the new army of Homare-Jima island. The New Emperor is Zerk of the SHOT guild. UTB stableyard and meeting house is now complete in its construction. Owned by Ryo-Ohki sister of Hinotori a native of PaxOku City. Hinotori use to own the Lucky Fox temple in PaxOku for those that have been around for too long. The house also has a pet training area which has already been tested out by Lord Gareth. From what I am told it is one of the most advanced training areas in the world. Bake Kitsuns spotted around town now more then ever. With Ryo and Hinotori back in the city they seem to be less shy now. PaxOku government asks that you please do not feed them. They are wild animals and could take your arm off. Ga'kuct is back and has answered 5 more questions for this Friday. This week he comments on the many things going on inside of PaxLair as well as trying to discover who is the owner of "Cross MacLeod's Defence Fortress". Proof has been discovered in Dragon's Watch that Elves are torturing and then murdering innocent Orcs. Klug da Stu Makr and Kar'nokz were on their way into Dragon's Watch to attempt to make a peaceful resolution with the Evil Elves and to "and to share knowledge and explore cultural differences through learning and understanding", until the Orcs caught wind of a stench, one that could only be emitted from decaying Orc bodies. They followed the smell and discovered a massacre of Orcish remains on top of one of the local establishments. Multiple Orcish helms and Orcish bones were scattered about the place as well as a whip, which may have been used in torture. The remains appeared to have been boiled and had all the meat removed, possibly for some sort of fiendish Elven dish, and the bones kept as trophies, with the helms as their crowns. 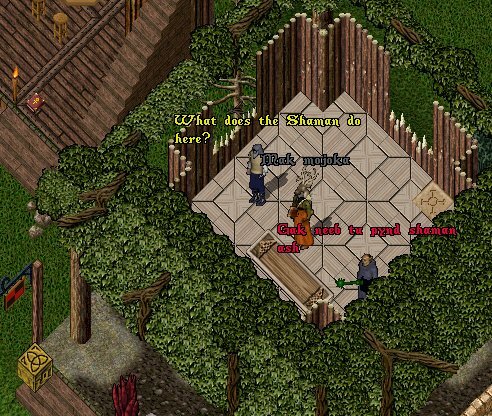 The Orcs' war against the homeless has sadly taken its first victim: the snaga hut (slave house) of John Duke. 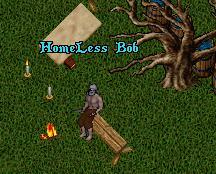 A homeless person commonly seen sneaking around PaxLair City, eluding capture and torture by the Orcs, by the name of 'Homeless Bob' has taken residence in the recently established Snaga Hut, next to the Ladies of the Lair. "I talked to him a few times," stated John Duke "I tried to report him but every time the Orcs came he was gone. He's almost as good as me when it comes to hiding and stealthing." "I wasn't too worried about him at first." he continued "but then he started sleeping in the woods outside my hut, slowly moving forward, until he was on my front porch. I still wasn't too concerned since I only need a very small space and it was still really out doors. So I didn't report it. But that all soon changed as I came back to my little hut for supplies and noticed it had been put into serious dismay as well as a message was left on the board stating 'Hello I have decided to squat here on your front porch. Squatters rights say I own this'."